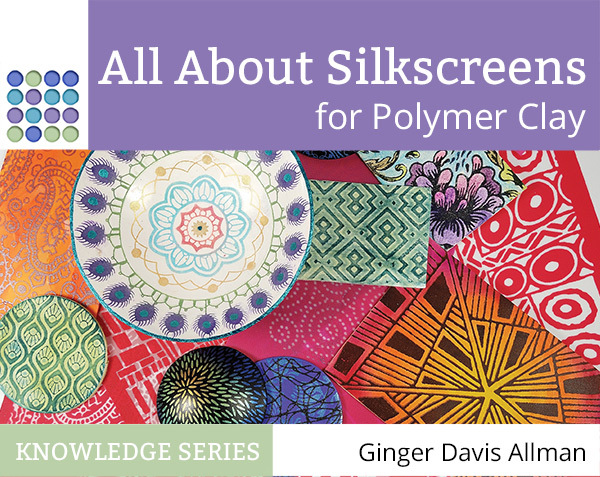 Are you eager to learn all about using silkscreens for polymer clay? Ever wondered how to use a silkscreen, how to clean it, what kinds of paints to use and how to create interesting designs with them? While this isn't a project tutorial, this 30 page eBook (pdf) goes into detail about every conceivable aspect of working with silkscreens on polymer clay. I explain about the different types of screens on the market and go into detail about how to use them effectively. The eBook features chapters on the types of screens, making prints, using paints, using powders, texture, and there's a large gallery section with specific information about colors, patterns and the paints that I used to make an array of designs concepts that you can adapt to use with your own library of silkscreens. I even include a comprehensive list of silkscreen makers and suppliers around the world. If you're looking for a project to make with silkscreens on polymer clay, then have a look at my Opulent Tapestry Tutorial that goes into detail about using a silkscreen to create a richly colored design that's used to make a pair of earrings. The All About Silkscreens ebook is part of my Knowledge Base Series, which will feature a selection of comprehensive ebooks that go into far more detail than is practical in my website articles.